Playing some DnD where building an effective character and achieving things effectively actually matters has been very nice. I don't want to play that style too much, it's a big investment of effort, but I was missing it. The mechanics for navigating an expansive underground maze worked almost perfectly. It really feels like feeling your way through routes you partially know but might shift any time. And generating a big batch of layout and bringing it up as people stumble across it has been very satisfying. The characters and players are really great. The inquisitive, acquisitive, goblin. The impulsive, swashbuckling cat-bard. The dour blood hunter. The rogue with a mysterious history. The players have generally been great even though I didn't know them well before. I've had lots of lovely ideas which have gone into sessions. Playing a not-too-long session every too weeks has gone reasonably. As always, my skills cat-herding players to turn up, and making sure everyone's clear on what's going on, have been a bit rusty. The sessions have all been quite slow, partly because I've been getting used to the sort of prep that works well in this kind of campaign, and partly just because there's a lot of players, and everyone is still getting used to what their characters can do. All the sessions left me feeling a bit like they were missing something but I wasn't sure what. That's not unexpected when I try to run a sort of game I haven't run before, but after some thought I think I got some idea. One problem is, a dnd game is typically a stream of small decisions: explore the hut or the cave? talk or fight? search casually or thoroughly? Often not even decisions spelled out, but formed implicitly from what the players naturally do. In this game, my hope is that the choice of routes through the labyrinth would often serve in this role, but because progress has been slower than I hoped, most of the navigation decisions haven't really had a lot of decision to make. Also, because I started off planning broadly, a lot of the individual things the characters encounter in one session are less well fleshed through than they might otherwise be, if I'd spent prep time thinking through what they were most likely to meet specifically. I've been doing more of this, even though it's more prep, but only needed to "top up" the places they're most likely going next, and hopefully can be reused if I use the same setting in future. And there just haven't been enough NPCs who've often brought games to life. The idea was, NPCs in the castle would interact with the PCs in advance, through rumours and quests offered, and slowly build up a relationship. But so far, every delve has taken multiple sessions, and it's taken two sessions to complete what I intended as the original starter goal, so no-one has had time to pursue "extra" leads. I need some more of this to happen in session so people engage with it more, even if that takes time. Dnd games that I've run well have always had fights designed well enough to be somewhat interesting, but have been brought to life by the ideas and npcs, the richness of the immediate setting as I've spent lots of prep time dwelling on it, and the characters have interacted with NPCs and environments in unexpected ways that have worked out because I've fleshed out characters and places to explore even if I wasn't sure if they'd be able to or not. I always used to think of myself as really analytical and less creative, so it's an adjustment to realise that's something that I can count as a success, and should expect to build up and rely on. But Liv's face when I talked about adding more NPCs made me realise it was well worth it. If possible, bringing more of the lore I worked out to the fore, it's been surprisingly hard to make it relevant, but it's come up a few times so I hope that works out. I've recently been experimenting with "no responsibility saturdays". I've toyed with similar things before, but partly I hadn't reached a point where the trade-offs were useful to me, and partly I think I tried variants that didn't draw the line on what to exclude in the right place. Specifically, my rule is, I can do anything I feel like, be it collapsing in front of the TV, playing games with Liv, getting on with a hobby project, going out to socialise or walk, exercise, or catching up on a behind todo list. But stuff I *need* to do, I'll set aside time some other time, so I don't have anything I *have* to do. Mostly, it's a rule that says I can ignore the voice in my head saying, "oh, but you really need to do X, you shouldn't do other stuff until you've done that". Which, well, maybe I should ignore that most of the time, The Voice isn't very good at choosing the right things to worry about. But I've always found it really hard to let go, and this helps. It hasn't made that much difference to what I've actually been doing, I've done some social things I knew I would enjoy, I've enjoyed time with R, I've done tidying, I've done books and tv. But I've felt a *lot* more relaxed about it. I guess "not have to do anything" is what weekends are supposed to be, and I just got the message late. But I always struggled with that: even when I didn't actually do much, it always felt like I *should* be doing something, that if I had time I should make the most of it by doing something really fun, or I should deal with one of hundreds of things I should "get to one day", or if I'm not doing that I should start a new project of some sort, etc, etc. I always felt like I had to do *everything*, so I tended to do *nothing*. I had to get over several hurdles to get to the point where I could try this. Likely I will get to the point where I don't *need* to do it. But in the meantime it's been surprisingly helpful, not just for that day, the uplifted spirits have carried over to more of the week too. 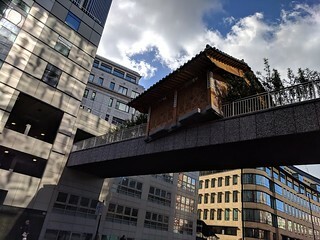 I caught a glimpse of a Korean house that had landed on a bridge above a busy road. I ran around Bristol wearing cat ears, while playing Ingress. An Anomaly was happening and I was a Media Moggy. My team, the Enlightened, won the Anomaly! I also did some missions for Mission Day, and some other missions that took me around Bristol to stare at some of the graffiti. I also tried some tatratea liqueur and met some fun new people. I walked on the pier in Herne Bay, and along the beach, past beach huts. I stared at the sea. I played Dance Dance Revolution in the arcade, and air hockey with my mum. Back in London, my shadow was captured at the Science Museum, which I visited with family, and we marvelled at rockets. I ate purple carrot cake flavour nitro ice-cream, went to Pub Standards for drinks with web folk, and visited the Photographer's Gallery and saw some challenging exhibitions. I celebrated sbp's 50th birthday in an unusually decorated pub. I ate lunch with jacquic at Stem + Glory. Aubergine, mmm. I had drinks with Frood. I visited the Riverside Gallery in Richmond and saw the Imprinted Memories exhibition and ate ice-cream at Danieli's. I saw a performance of the Myth of the Singular Moment at the Vaults Festival. Must try to go to see more things next year! I walked on Wimbledon Common, but didn't see any Wombles. I think I ate goujons for the first time. I'm not sure what the difference between goujons and fish fingers is though really. I ate a sweet marked “surreal” and thought perhaps it would make my day more surreal. Rainbow bagels appeared after that. I went to the Barbican and watched a video of a game based on the artist's grandmother's dream diaries. I went to the Wellcome Collection Late on Cyborgs and listened to a talk by people who have designed objects such as a scarf that confuses facial recognition systems and VR experiences. I played a VR experience that started in a salon and ended up by some goddesses who had some words of wisdom. I watched a video of cyborgs dancing. I ate a Lego biscuit and stared at the wonders of the world made from Lego, and twanged a few instruments. I gazed out over London from 120 Fenchurch Street and bumped into friends there briefly. I enjoyed the view. It snowed very briefly then also. I wandered through Camden and went to ChinChin Labs and ate a St Patrick's Day sundae which had lucky clover ice cream, chocolate potato cake and stout chocolate sauce. I headed to the British Library and went to an exhibition on Cats on Page, which was about books that contain cats. I listened to sounds of cats and guessed what the cats were doing. I listened to Adrian Edmondson reading The Cat in the Hat. I read about cats that are detectives and cats with magical powers and poems about cats. I listened to the Top Cat theme and then to Lovecats and danced a little bit in the library then. After that, I went to Japan House and saw an exhibition on Prototyping in Tokyo and saw robot tardigrades and artificial limbs and 3D printed structures that moved pleasantly when you picked them up. I met up with a friend and tried a taste of durian ice cream, but the taste still makes me feel nauseous, so then I opted for Hong Kong Milk Tea ice cream in a green macaron. I wandered into Selfridge's to look at a skip, but the art wasn't that exciting and the performances were not that often. I went to Ladies that UX and listened to lightning talks. The moon looked beautiful on my way home. I helped create cross-faction field art in Ingress – making a picture of the EU flag in the game by walking to different locations around London. I went to a video game dating event! I did June Challenge I. (c) Buses, but which June I did it in, I am unsure now. Maybe I have photos and tracks to accompany it somewhere. Anyway, for this challenge, I got on the first bus that came along, then got off after 9 stops. The next Tube Walk will be on Sunday 14th April - this Sunday! We'll be walking from South Quay to Crossharbour and meeting EARLY at 1pm. Hope to see you there!